Edited by Richard Kwong Wai Choy and Tak Yeung Leung . As new technological innovations arise, clinical medicine must also adapt and assimilate these advances into clinical practice. Prenatal diagnosis is no exception. When amniocentesis was introduced into practice, study of the unbanded chromosomes was the standard. With the introduction of G-banded analysis, duplications, deletions, and gross chromosomal translocations were detectable. By comparing the phenotypic to the genotypic findings, most of the detected chromosomal aberrations were quickly found to be clinically relevant. Integrating this new information into patient care and counseling required years of data gathering and analysis. As clinical and molecular technologies continued to evolve, similar questions concerning the appropriate clinical use of these technologies in prenatal diagnosis have also arisen. Prenatal Diagnosis: Morphology Scan and Invasive Methods brings together distinguished contributors with extensive experience in the fetal ultrasound and prenatal diagnosis fields. 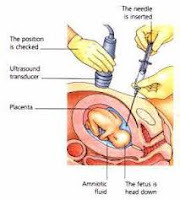 Emphasis has been paid to the inclusion of molecular and sonographic techniques used in fetal medicine that are relevant to obstetricians and scientists performing prenatal diagnosis. These include how to diagnose iodine deficiency, skeletal dysplasisa; methods for molecular diagnosis of fetal diseases and treatment by fetal therapy. We hope that this book will be an invaluable reference for obstetricians and scientists in the process of prenatal diagnosis.